Kuala Lumpur, 15 December 2016 – Sime Darby launched the country’s first ever food surplus app - Robin Food - which was the winning idea during the Sime Darby Young Innovators Challenge (SDYIC) 2016 held in June this year. 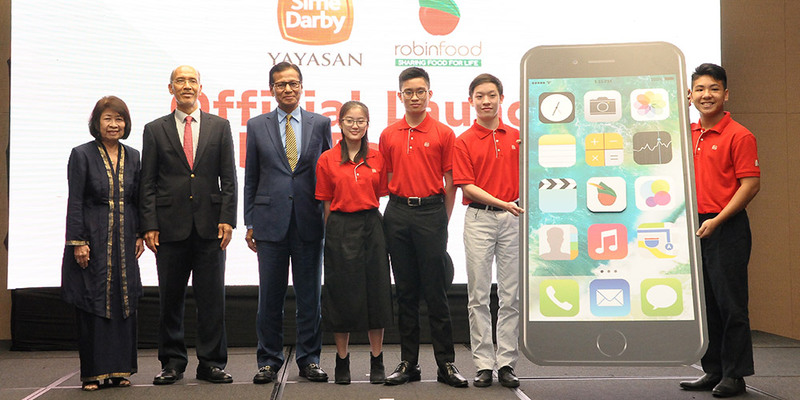 The Robin Food app, unveiled today at the Sime Darby Convention Centre was the brainchild of the winning team of four teenagers from East Malaysia aged between 14 and 16, who won the hearts of judges during the SDYIC2016 finale. The SDYIC is an initiative funded by Yayasan Sime Darby to expose youths in Malaysia to practical innovation skills and creative solutions. Participants of the SDYIC2016, working in teams, were asked to present their best solutions in line with the theme: People, Planet and Prosperity. The prototype of the app, originally created by Team Robin Food as their entry for the finals, was developed to meet the challenge statement of the SDYIC 2016 – to overcome the global issue of poverty. The app connects supermarkets with extra food to NGOs and charitable organisations which in turn will distribute the food to the urban poor and the homeless. The Robin Food app will also enable corporations and hotels to contribute surplus food to the needy through the app to dedicated food banks while individual contributions can be made directly to the food banks. Through the app, corporations with food surplus will be able to inform food banks on the availability of excess food and arrange for collection within minutes. This is currently being done manually, which is time consuming and tedious. Tesco Malaysia will be Robin Food’s main contributor while Food Aid Foundation (FAF) will organise food distribution to other organisations and charities. 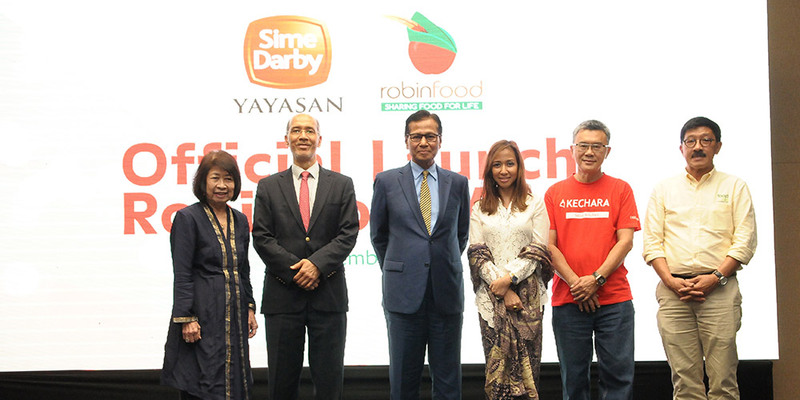 Speaking at the launch of Robin Food, Sime Darby Chairman Tan Sri Dato’ Abdul Ghani Othman said as a company that is ultimately owned by Malaysians, Sime Darby is also obliged to contribute towards the nation building agenda. “We hope, that through the Robin Food app, we will be able to minimise food wastage, so that food items can be channeled to the charitable organisations to feed the hungry and homeless. It is our sincere hope that this app will be successful,” he added. Sime Darby’s Group Chief Strategy & Innovation Officer Hari Nair highlighted the importance of nurturing young minds to think innovatively. “Our aim is to encourage youths in Malaysia to dabble with the fundamentals of innovation while challenging their creativity. We want to empower them with various elements of innovation including design thinking, prototyping, leadership and entrepreneurship,” Hari added. Present at today’s launch were Sime Darby President and Group Chief Executive Tan Sri Dato’ Seri Mohd Bakke Salleh, Tengku Zatashah Sultan Sharafudin Idris Shah, Yayasan Sime Darby governing council members, representatives from Tesco Malaysia, Food Aid Foundation and Kechara Soup Kitchen Society. Also present at the launch were Allegra Chan Qin Hur, Ezra Adrian Robert, Ivan Avannus and Joseph Chung of Team Robin Food, the creators of the original prototype. During the launch, Tan Sri Dato’ Abdul Ghani also handed over food items, contributed by Sime Darby employees to representatives from Food Aid Foundation and Kechara Soup Kitchen Society. Tengku Zatashah, a volunteer with Kechara Soup Kitchen Society witnessed the handover. The week-long collection drive saw employees of Sime Darby donating 5,500kgs and 200 litres of food items. Food items donated included essential goods such as cooking oil, rice, biscuits and tinned food. Following the success of the inaugural SDYIC2016, Sime Darby is embarking on the next SDYIC2017 which will commence in January 2017. Yayasan Sime Darby Governing Council Member Datin Paduka Zaitoon Dato’ Othman, Sime Darby President and Group Chief Executive Tan Sri Dato’ Seri Bakke Salleh and Sime Darby Chairman Tan Sri Dato’ Abdul Ghani Othman, Princess of Selangor Tengku Zatashah Sultan Sharafuddin Idris Shah with the Robin Food app partners Kechara Soup Kitchen Society President Henry Ooi and Food Aid Foundation Founder Rick Chee at the launch of the Robin Food app. Yayasan Sime Darby Governing Council Member Datin Paduka Zaitoon Dato’ Othman, Sime Darby President and Group Chief Executive Tan Sri Dato’ Seri Bakke Salleh and Sime Darby Chairman Tan Sri Dato’ Abdul Ghani Othman with the Robin Food team members Allegra Chan Qin Hur (16), Ivan Avannus (15), Joseph Chung (14) and Ezra Adrian Robert (15) at the launch of the Robin Food app.